The Bush administration is intellectually corrupt. Some of this corruption is induced by the inability to keep religion in its place. The president suffers mightily from this. After just eight months in office, George Bush drew a line between acceptable and unacceptable stem cell research and based it entirely on religious views that had nothing to do with science. Similarly, the Bush administration has somehow bottled up Plan B emergency contraception so that it is not yet available over the counter to women 17 and older. This is the case not because Plan B is dangerous or ineffective or even because it is an abortion agent (it is not), but because it is manifestly something that’s needed if abstinence is, somehow, not practiced. In other words, the scientific basis for this policy apparently comes down to this: A good girl should not need such a pill. Honestly, I am loving this column so much, and it seems like such a reflection of some previous blog posts of mine, that I encourage you once more to read the original. He deals with global warming, intelligent design, and the Iraq War with similar incisiveness. Bravo, Mr. Cohen! The moronic level of cable discourse notwithstanding, missing from almost all discussions of the role of religion in public life is what William James famously termed the “varieties of religious experience.” The right-wing hijacking of religion’s public role in our political discourse is as undeniable as it is inappropriate, and represents one of liberalism’s most serious problems. Indeed. Religion has an important role, as a way for people to agree on deeply held beliefs, or discuss the dignity of every human being, rich or poor. Alterman points out that Liberals should own Christianity at least on economic policy alone. The Republican perversion of science and religion alike demeans both. Conservatives, won’t you please take advantage of Conservative Amnesty Month? At the right hand side of the page is a list of other progressive bloggers who will support you. We want you to know that we’re here for you. I visited the American Museum of Natural History today, and, as usual, I was amazed at the depth and breadth of the exhibits there. It being the Sunday of a holiday weekend, the place was full to bursting, especially with children begging for astronaut ice cream or a stuffed Tyrannosaurus Rex. The museum taught me something else as well, though, something that can help us deal with the growing anti-science movement in this country. You’ll notice a prominent element in that photograph. 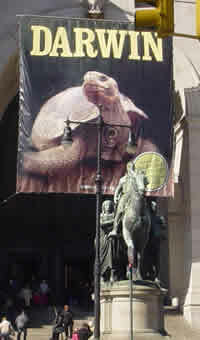 Above the statue of Teddy Roosevelt on a horse, a triumphant Galapagos Tortoise adorns the DARWIN banner. I have been to see the exhibit about his life, and one of the elements that surprised me had to do with Darwin’s conflicted feelings on religion. Indeed, as I thought about the different exhibits I saw today, a common element emerged that showed an effective way to approach the feeling in this country that science and religion do not mix. You see, museums have become one of the new fronts in this debate. The growing number of Americans who feel that evolution is not accurate have, apparently, decided that museums are as guilty as science classrooms of teaching immoral, inappropriate things to innocent children. It is no secret why some people feel this way. They believe that they already know the correct explanation for why things are the way they are, and any evidence to the contrary must be wrong. The creationists Darksyde profiles for us are excellent examples of this effect. Once knowing, for certain, how everything works becomes an important part of your self worth, it becomes difficult to handle new discoveries. Upstairs in the museum, I noticed this interesting illustration among the exquisitely reconstructed dinosaur skeletons. By Odin’s beard! It’s an evolutionary tree of the descent of the Tetanuran (Three-Fingered Hand) dinosaurs. And, as I verified from the skeleton evidence all around me, it seems awfully clear and valid. It also did not seem immediately threatening to the moral development of the many children around me. 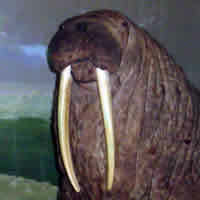 I visited the Hall of Marine Mammals, where I saw one of my personal favorites. This fellow was staring out at the busy floor, surrounded by a whole bunch of scientifically accurate and thoroughly evolution-drenched material, and everyone seemed to be okay. Indeed, they seemed to be enjoying themselves. I became more and more confused. I didn’t get why people would object to this stuff. When I went to the Rose Space Center to see the planetarium show, Passport to the Universe, I was impressed by the clarity of the scientific narrative of the film. It takes a journey from Earth all the way out to the scale of the observable universe, which is, as I learned, very, very large. As I have mentioned before, there were many children in the museum, and just so there were many in the theater as well. When the show ended, with a scientifically questionable rapid transit back to earth via black hole, one of the children began to cry. The child was saying how this was scary, and how she didn’t like it, and I realized something. The anti-science crusaders are like this child. They are scared of things that challenge their understanding of the universe. They cherish the idea that they know the truth about the world, and new discoveries threaten this perception. This is the crux of the issue: we think of science as a pathway to beneficial and wonderful discoveries, but they see it as a dangerous fountain, sometimes producing benefits, but other times producing strange, unorthodox, and threatening ideas. On the way out of the museum, I thought this over more and more. How can you talk with someone about these matters if they refuse to budge on their core belief? Well, I figured, the same way you would talk to anyone unfamiliar with new and intimidating terrain. Show them the wondrous parts first, and engage their curiousity. It might not work in every case, but I think if more creationists went to museums, and could see how amazing the universe really is, they would get less attached to teaching garbage to our children. If you believe in god, there is nothing in a museum to take away from his glory in having created it all. I don’t believe in god, and I can still tear up at a view of the virgo supercluster, with a tiny highlighted sphere that shows where I live. In this week’s New Yorker Hendrik Hertzberg makes two interesting points regarding the language of W’s State of the Union Speech. “War on Terror” has always been problematic, at both ends. The word “war” has the requisite urgency, and it has proved useful in intimidating the political opposition at home. But, as we have seen in Iraq and elsewhere, its associations–pitched battles, clashing states, disciplined armies with general staffs–can invite actions that are, at best, beside the point. “Terror” is not a conquerable enemy, or an end in itself. This rings very true. As time has passed since 9/11, the War on Terror has become less a system to eliminate extant threats to the United States and more a justification for the President to do basically whatever he wants. Overwrought 1984 references notwithstanding, when the President authorizes himself to do whatever he wants because we are at war, and yet defines that war such that it can never end, it doesn’t take a pessimist to sense dystopia around the corner. He defended–no, boasted of–the National Security Agency’s vast, formerly secret program of warrantless electronic eavesdropping, undertaken on his orers and rebranded in his speech as “the terrorist-surveillance program.” “If there are people inside our country wwho are talking with Al Qaeda,” he said, “we want to know about it, because we will not sit back andd wait to be hit again.” But those who are questioning Bush’s program, both Democrats and Republicans, agree that terrorists must be surveilled. What alarms them is not jusst that the President is breaking a particular law, the Foreign Intelligence Surveillance Act, but that his rationale for doing so amounts to a claim that he can flout any law at all, as long as the flouting is under cover of an endless . . . war. Dystopic indeed. I love reading Hertzberg because he gets right to the heart of the matter, and with such clarity. Bush appears to think that as long as the War on Terror is going on, which will be forever, he can do anything he personally deems necessary to prosecute it. I can’t wait for 2006 mid term elections.